David Gill is a licensed architect with over 20 years of practice. He received a Bachelor of Architecture with Distinction from California College of Arts and Crafts (now CCA). He went on to work for Kuth / Ranieri, for Baum / Thornley Architects, and had his own practice in Berkeley. Gill is presently a project architect at Mark Horton / Architecture in San Francisco. Recent projects include Modesto Commerce Bank, House of Air SF, House of Air Mammoth Lakes, Computer History Museum, Temple Sinai, numerous custom residential projects and a conceptual proposal for the Contemporary Art Museum at the Presidio. He is designing a community arts center for Shipyard Community Arts, an organization for which Gill also serves as a board member. 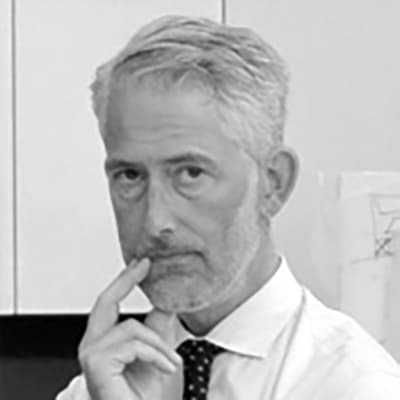 Gill is also currently a faculty member at the graduate school of architecture at Academy of Art University, teaching advanced design studios, thesis development and refinement, and materials and methods. He has also taught graduate design studios at CCA, and has been a guest critic at University of San Francisco, University of California at Berkeley and Cal Poly SLO. David Gill’s interests – both professional and academic – lie in the materiality of architecture; the tectonic, poetic and cultural meanings in fundamental materials. How these materials/meanings are perceived, in turn, inform the design process. Drawing connections is both a literal and a figurative pursuit; an endlessly evolving practice.